The loss of nigral dopaminergic (DA) neurons in idiopathic Parkinson's disease (PD) is believed to result from interactions between genetic susceptibility and environmental factors. Evidence that inflammatory processes modulate PD risk comes from prospective studies that suggest that higher plasma concentrations of a number of proinflammatory cytokines correlate with an increased risk of developing PD and chronic nonsteroidal anti-inflammatory drug regimens reduce the incidence of PD. 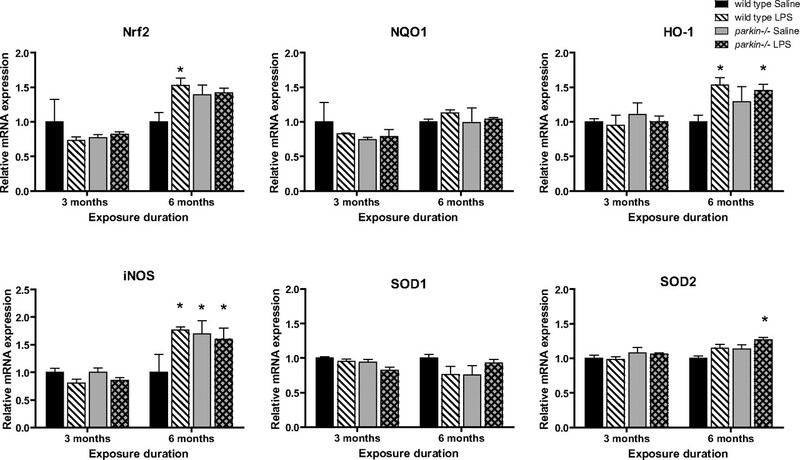 Although loss-of-function mutations in the parkin gene cause early-onset familial PD, Parkin-deficient (parkin−/−) mice do not display nigrostriatal pathway degeneration, suggesting that a genetic factor is not sufficient, and an environmental trigger may be needed to cause nigral DA neuron loss. To test the hypothesis that parkin−/− mice require an inflammatory stimulus to develop nigral DA neuron loss, low-dose lipopolysaccaride (LPS) was administered intraperitoneally for prolonged periods. Quantitative real-time PCR and immunofluorescence labeling of inflammatory markers indicated that this systemic LPS treatment regimen triggered persistent neuroinflammation in wild-type and parkin−/− mice. Although inflammatory and oxidative stress responses to the inflammation regimen did not differ significantly between the two genotypes, only parkin−/− mice displayed subtle fine-motor deficits and selective loss of DA neurons in substantia nigra. Therefore, our studies suggest that loss of Parkin function increases the vulnerability of nigral DA neurons to inflammation-related degeneration. This new model of nigral DA neuron loss may enable identification of early biomarkers of degeneration and aid in preclinical screening efforts to identify compounds that can halt or delay the progressive degeneration of the nigrostriatal pathway. Parkinson's disease (PD) is primarily characterized by degeneration of dopaminergic (DA) neurons in the substantia nigra pars compacta (SNpc) that project to the striatum, the output of which governs locomotor behavior. Although 90–95% of PD cases have no known genetic basis, ∼5–10% arise from inherited mutations (for review, see Farrer, 2006). Approximately one-half of early-onset PD is caused by loss-of-function mutations in the parkin gene (Lücking et al., 2000), which encodes an E3 ubiquitin ligase. The age of onset of parkinsonism in humans bearing parkin mutations can vary significantly, even within families carrying identical mutant alleles (Lücking et al., 2000). Although parkin−/− mice have dopaminergic system dysfunction, unlike humans bearing parkin mutations, they do not display nigrostriatal pathway degeneration (Goldberg et al., 2003; Itier et al., 2003; Von Coelln et al., 2004; Zhu et al., 2007). A wealth of evidence in the last decade indicates that dysregulated neuron–glia interactions result in neuronal loss (Wersinger and Sidhu, 2002; McGeer et al., 2003; Mrak and Griffin, 2005; Zhang et al., 2006; Tansey et al., 2007). Postmortem examination of brains from PD patients confirms the presence of neuroinflammation, raising the possibility that inflammatory mediators contribute to the progression of PD (McGeer et al., 1988; Banati et al., 1998; Hunot et al., 1999; Cassarino et al., 2000; Pavese et al., 2006; Whitton, 2007). Although end-stage analysis does not prove a causal link, in vivo imaging of microglial activation with the peripheral benzodiazepine receptor binding ligand [11C]-(R)-PK11195 [1-(2-chloro-phenyl)-N-methyl-N-(1-methylpropyl)-1-isoquinoline carboxamide] in positron emission tomography scans confirms that regardless of the number of years with the disease, patients with idiopathic PD have markedly elevated neuroinflammation in the pons, basal ganglia, striatum, and frontal and temporal cortical regions compared with age-matched healthy controls (Gerhard et al., 2006). Therefore, microglia may become and remain activated early in the disease process, possibly contributing to disease progression [for review, see Tansey et al. (2007) and Whitton (2007)]. Evidence that inflammatory processes modulate PD risk in humans comes from prospective studies that suggest that higher plasma concentrations of the proinflammatory cytokine interleukin-6 increased the risk of developing PD (Chen et al., 2008) and chronic nonsteroidal anti-inflammatory drug (NSAID) regimens reduced the incidence of PD by 46% (Chen et al., 2003, 2005). However, because other studies do not find significant protection by NSAIDs (Ton et al., 2006), additional studies are needed to establish a causal role for inflammation in the interplay between genetics and environment as underlying factors in the pathogenesis of PD. The purpose of this study was to test the hypothesis that Parkin deficiency increases vulnerability to inflammation-related nigral degeneration. To this end, we exposed parkin−/− and wild-type mice to repeated intraperitoneal injections of low-dose lipopolysaccaride (LPS) and evaluated locomotor behavior, nigral DA neuron loss, and markers of neuroinflammation and oxidative stress. All mice were housed in a pathogen-free, climate-controlled facility in the Animal Resources Center at The University of Texas Southwestern Medical Center at Dallas and given food and water ad libitum. All animal studies were reviewed and approved by the Institutional Animal Care and Use Committee at The University of Texas Southwestern Medical Center at Dallas in accordance with the National Institutes of Health Guide for the Care and Use of Laboratory Animals. The regimen of LPS injections for our studies was chosen based on published protocols that have been shown to trigger a neuroinflammatory response and hasten appearance and progression of amyloid-associated burden in a transgenic mouse model of Alzheimer's disease (Kitazawa et al., 2005). Young adult (6–13 weeks old) parkin−/− mice on a C57BL/6 background (backcrossed for >10 generations) and age-matched wild-type mice were given either 7.5 × 105 EU/kg LPS from Escherichia coli O111:B4 (Sigma-Aldrich) or 0.9% sodium chloride (vehicle control; Braun Medical) injections intraperitoneally twice a week for 2 months (n = 3 mice per group), 3 months (n = 11–12 mice per group), or 6 months (n = 11–12 mice per group) (Fig. 1; supplemental Fig. S1, available at www.jneurosci.org as supplemental material). An additional group was given systemic LPS or vehicle for 3 months followed by a 3 month wait period during which no additional intraperitoneal injections were administered (n = 8 mice per group). After the last intraperitoneal injection, the animals were divided into two sets and processed for either immunohistochemistry or quantitative real-time PCR (QPCR) (Fig. 1). For all behavioral tests, mice (n = 8 per group) were evaluated at baseline (before i.p. injections began) and depending on the regimen again at 3 and 6 months after LPS or saline administration (Fig. 1). Open-field behavior in a glass container (diameter, 24.5 cm) was recorded for 5 min for evaluation of time spent moving and number of rearing events by an investigator blinded to genotype and treatment history. A narrow beam (1.1 cm diameter, 80.6 cm testing length) with a home cage at one end was used. Initial training before treatment consisted of three sessions of three trials per session for 4 consecutive days. Mice received additional training sessions at 3 and 6 months after the start of treatment regimen consisting of three sessions of three trials per session on 1 d. Testing was conducted the day after training and consisted of one session of three trials. Average time to traverse the full length of the beam was determined and used for data analysis. A base speed of 20 rpm with an acceleration of 0.2 rpm/s was used on the rotarod (Economex 0207-005 M; Columbus Instruments). Mice were trained before treatment in three sessions of four trials each for 4 consecutive days. Mice received additional training sessions at 3 and 6 months after start of treatment consisting of three sessions of four trials per session on 1 d. Testing consisted of one session of three trials the day after training was completed. Latency to fall (in seconds) was calculated and used for data analysis. After the last intraperitoneal injection, mice in the 2 month cohort (n = 3 mice per treatment group) were deeply anesthetized with halothane and decapitated, and the brain was rapidly removed and microdissected into four regions on an ice-cold glass Petri dish [olfactory bulb, cerebellum, ventral midbrain (MB), and cortex (CX)] and then snap frozen in liquid nitrogen and stored at −80°C until processed for RNA extraction. For QPCR, mice in the 3 month, 3 month/3 month wait, and 6 month treatment cohort (n = 4 mice per treatment group) were deeply anesthetized with Euthasol and then intracardially perfused with 0.1 m PBS, pH 7.4, supplemented with 0.1% glucose and 1 U/ml heparin before rapid whole-brain removal. Microdissected tissue was snap frozen or put in RNAlater (Ambion) and stored at −80° until processed for QPCR. For immunohistochemistry, mice in the 3 month, 3 month/3 month wait, and 6 month treatment cohort (n = 7–8 mice per group) were perfused with 0.1 m PBS followed by 4% paraformaldehyde in PBS, pH 7.4. Brains (in the skull) were postfixed overnight in 4% paraformaldehyde. Brains were dissected out then cryoprotected for 24 h in 20% sucrose in 0.1 m PBS, pH 7.4, embedded in Neg 50 (Richard Allen Scientific), and frozen in dry ice-cooled isopentane. Total RNA was isolated from tissue samples using Tri Reagent (Molecular Research Center), treated with DNase I (Invitrogen), and reverse transcribed to obtain cDNA. QPCR was performed using SYBR Green Master Mix (ABI) on an Applied Biosystems Prism 7900HT sequence detection system as described previously (Kurrasch et al., 2004). Primers for each gene (available upon request) were designed using Primer Express Software (PerkinElmer Life Sciences) and validated by analysis of template titration and dissociation curves. Results for QPCR were normalized to the housekeeping gene cyclophilin B and evaluated by comparative CT method (user bulletin No. 2; PerkinElmer Life Sciences). RNA levels are expressed relative to the wild-type saline-injected (vehicle) mice. Coronal serial sections (30 μm thickness) were cut on a Leica CM 1850 cryostat and placed on Superfrost/Plus microscope slides (Fisher Scientific). Sections on slides were stored at −80°C until processed for immunohistochemistry. Sections were stained for tyrosine hydroxylase (TH) using published protocols (Abbott and Jacobowitz, 1995; Frank et al., 2003). Sections were permeabilized in 0.3% Triton X-100 in PBS, pH 7.4. Endogenous peroxidases were quenched with 1% H2O2, and nonspecific binding was blocked with 5% normal serum (goat or horse; Equitech-Bio). Sections were incubated with primary antibodies against TH (rabbit polyclonal diluted 1:2000; Millipore Bioscience Research Reagents), or neuronal nuclear antigen (NeuN) (mouse monoclonal diluted 1:1000; Millipore Bioscience Research Reagents) overnight at room temperature followed by biotinylated secondary antibody (goat anti-rabbit or horse anti-mouse rat absorbed, or goat anti-rat IgG diluted 1:400; Vector Laboratories) and NeutrAvidin-HRP (diluted 1:5000; Pierce Biotechnology). The tissue bound peroxidase activity was developed with a 0.024% diaminobenzidine (DAB; Sigma) and 0.006% H2O2 in 0.05 m Tris-HCl buffer, pH 7.6, for 20 min with or without nickel intensification. Tissue sections were dehydrated in a graded series of ethanols, immersed in xylene, and coverslipped with Permount (Fisher Scientific). Brain sections were stained for microglial markers using a standard immunofluorescence protocol (McCoy et al., 2006). Autofluorescence was quenched in 0.2 m glycine in PBS, pH 7.4, for 1 h at room temperature. Sections were then permeabilized in 0.3% Triton X-100 with 1% normal goat serum in 20 mm Tris-buffered saline (TBS), pH 7.4. Nonspecific binding was blocked with species-appropriate 1% normal serum in TBS. Sections were incubated overnight at 4°C with rat monoclonal antibody made against mouse CD68 (diluted 1:150; Serotec) and rabbit polyclonal anti-TH (diluted 1:250; Millipore Bioscience Research Reagents) followed by Alexa-488 goat anti-rabbit (Invitrogen) secondary antibody (Fab) or Alexa-594 goat anti-rat secondary antibody (each at 1:1000 dilution; Invitrogen) for 4 h at room temperature. Antibodies were diluted in blocking buffer with 0.1% Triton X-100. Washes were done in TBS with 0.2% Triton X-100. After secondary antibody incubations, slides were rinsed briefly with distilled H2O, then counterstained with Hoescht 33258 (at 1:20,000; Invitrogen) for 15 min and coverslipped with aqueous mounting media with anti-fade (Biomeda). The optical fractionator probe of Stereoinvestigator software (MicroBrightField) was used to obtain an unbiased estimate of TH-positive and NeuN-positive neurons in the SNpc and ventral tegmental area (VTA) as per the atlas of Paxinos and Franklin (2001). Stereologic parameters were as follows: counting frame, 50 × 50 μm; optical dissector, 20 μm; grid size, 120 × 160 μm. For the population size estimate (number of sections per animal), a target coefficient of error (Gundersen's m = 1) of <0.10 was considered acceptable. Coronal serial sections (30 μm thickness) were cut between bregma −1.22 and 1.70 on a Leica CM 1850 cryostat and placed on Superfrost/Plus microscope slides (Fisher Scientific). Tissue sections were immunostained for TH and developed using DAB as described above. Images of striatum (caudate putamen) from 12 tissue sections per animal were taken with a color digital camera (Model CX9000) mounted on a Nikon Eclipse 80i microscope. Exposure times were kept constant for all images. TH-positive fiber density was determined using background-corrected integrated optical density measurements for each section using an Alpha Innotech FluorChem FC2 imaging workstation and software. All sections for each animal were averaged, and group means were used to compare treatment groups. Levels of striatal DA and its metabolites [3,4-dihydroxyphenylacetic acid (DOPAC), homovanillic acid (HVA), and 3-methoxytyramine (3-MT)] were quantified by HPLC with electrochemical detection. Mice were killed by carbon dioxide asphyxiation, and the striatum was immediately dissected on an ice-cold glass Petri dish, weighed, and stored at −80 until analysis. Frozen brain tissue was sonicated in 49 volume/weight (mg of tissue) of 0.1 m perchloric acid containing 0.2 mm sodium metabisulfite and centrifuged at 20,000 rpm for 20 min at 4°C in a benchtop centrifuge to clear debris. Twenty microliters of cleared supernatant were injected onto a C18 HPLC column and separated by isocratic elution at a flow rate of 0.6 ml/min with MD-TM mobile phase (ESA). Neurotransmitter monoamines and metabolites were detected using a BAS electrochemical cell set to a potential of +800 mV and compared with external standards. Multiple-way ANOVAs with significance level α = 0.05 were used as indicated for each set of experimental data. Significant differences between groups were further evaluated using Tukey's honestly significant difference (HSD) post hoc test. Kruskal–Wallis analysis was the nonparametric statistical test used for testing equality of population medians of integrated optical density measurements of striatal TH fiber density. First, we sought to establish proof of concept that our prolonged, serial regimen of low-dose intraperitoneal LPS injections could trigger an inflammatory response in the CNS. Therefore, we evaluated the expression of inflammation-related genes in various brain regions of young adult wild-type and parkin−/− mice. All mice in the proof-of-concept cohort were killed after 2 months of twice-weekly intraperitoneal LPS or saline (vehicle) injections (supplemental Fig. 1A, available at www.jneurosci.org as supplemental material). 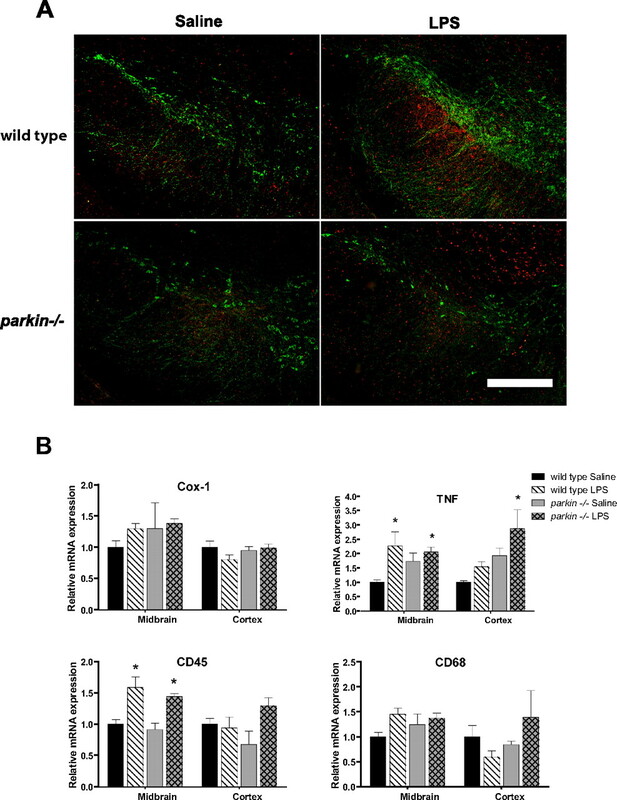 Wild-type and parkin−/− mice responded to repeated systemic low-dose LPS with similar (approximately twofold) increases in Cox-1 mRNA in olfactory bulb and increases in CD45 mRNA, a membrane-associated tyrosine phosphatase upregulated in activated microglia, in midbrain; but neither Cox-1 nor CD45 were upregulated in the cortex (supplemental Fig. 1B, available at www.jneurosci.org as supplemental material) (three-way ANOVA, Tukey's HSD post hoc at α = 0.05; TNF: F (15,47) = 2.11, p = 0.037; CD45: F (15,46) = 4.48, p = 0.0002; Cox-1: F (15,47) = 2.19, p = 0.031). No significant increase in expression of mRNA tissue content for the pan-microglial marker CD68 was detected (p = 0.26). Together, these data provide proof of concept that our prolonged, serial low-dose systemic LPS injection regimen successfully triggered a neuroinflammatory response in anatomical regions that show early involvement in PD (olfactory bulb and midbrain) and not in areas that are unaffected in the early stages of the disease (cortex) in both wild-type and parkin−/− mice. We performed behavioral testing on all treatment groups (Fig. 1) to investigate the extent to which the prolonged, serial low-dose systemic LPS regimens could cause locomotor alterations. A number of behavioral tasks were measured at the time points indicated until the various cohorts were killed for gene expression or immunohistological analysis of microdissected brain tissue. To assess gross locomotion, we measured open-field and rotarod performance. No differences were noted on rotarod performance (Fig. 2 A) (p = 0.19) or open-field testing (data not shown). Thus, in the present study, prolonged, serial intraperitoneal injections of LPS or saline did not cause gross motor abnormalities. To assess fine-motor performance, mice were subjected to the narrow beam-walk test. Our results indicate that parkin−/− mice chronically injected with LPS displayed a significantly slower average time to cross than saline-treated parkin−/− mice or either group of wild-type mice (Fig. 2 B) (three-way ANOVA Tukey's HSD post hoc at α = 0.05; beam: F (15,248) = 8.55, p < 0.0001). Schematic of systemic LPS administration regimens and measurable outcomes. Wild-type and parkin−/− mice were given low-dose LPS or an equivalent volume of saline vehicle twice a week intraperitoneally for the indicated times. Locomotor behavior was evaluated before and during the course of treatment. Groups of animals were killed as indicated for biochemical and immunohistological analyses. IHC, Immunohistochemistry. 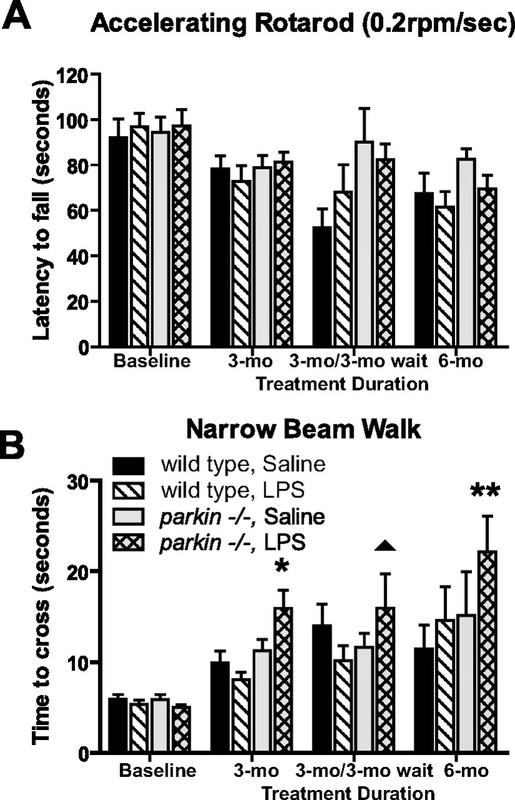 Fine-locomotor deficits in Parkin−/− mice exposed to prolonged, serial low-dose systemic LPS. A , No significant differences were detected between genotypes or treatment groups on accelerating rotarod, suggesting no general malaise. Bars represent mean ± SEM; n = 8 per group. B , parkin−/− mice display significantly prolonged time to cross on narrow beam walk after LPS treatment regimens. Asterisks indicate significant differences compared with saline-treated wild-type and LPS-treated wild-type group, whereas double asterisks indicate difference from all other groups. The triangle indicates a significant difference compared with LPS-treated wild-type animals only. To test the hypothesis that Parkin deficiency increases vulnerability to inflammation-related nigral degeneration, we exposed wild-type and parkin−/− mice to various systemic LPS regimens (Fig. 1). We measured endpoint immunohistological outcomes for unbiased stereological analyses of DA neuron number and total neuron number by staining midbrain sections with the DA neuron marker TH and the pan-neuronal marker NeuN (Fig. 3 C). Compared with similarly dosed wild-type mice, parkin−/− mice that received 3 months of repeated low-dose systemic LPS did not exhibit significant reductions in TH-positive or NeuN-positive neurons in the SNpc. In contrast, parkin−/− mice but not wild-type mice that received 3 months of repeated low-dose systemic LPS followed by a 3 month lag period displayed a significant reduction in the number of both TH-positive and NeuN-positive SNpc neurons (Fig. 3 A,C) (three-way ANOVA; Tukey's HSD post hoc at α = 0.05; SNpc TH: F (11,75) = 4.78, p < 0.0001; SNpc NeuN: F (11,75) = 3.54, p = 0.0007). Wild-type mice that were injected with low-dose LPS for 6 months displayed a reduction in the number of TH-positive neurons but not of NeuN-positive SNpc neurons (Fig. 3 A). 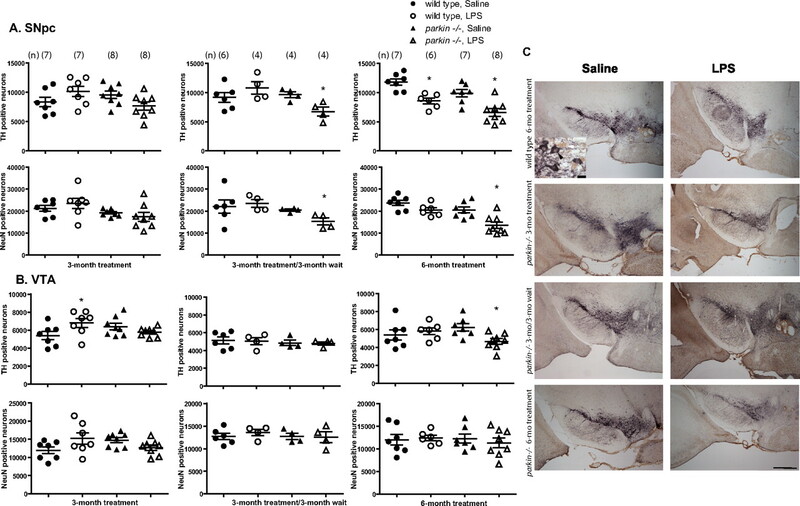 In contrast, parkin−/− mice that received low-dose LPS for 6 months showed significant loss of SNpc TH-positive and NeuN-positive neurons compared with saline-treated parkin−/− mice and with wild-type mice treated with either saline or LPS. To investigate the extent to which the loss of DA neurons was selective to nigra, we performed stereological counts of TH- and NeuN-positive cells in VTA. VTA TH-positive and NeuN-positive cell counts did not differ between the two genotypes in any of the different LPS regimens with the exception of a slight but significant reduction in the number of TH-positive (but not NeuN-positive) neurons in the parkin−/− mice treated for 6 months with low-dose systemic LPS (Fig. 3 B) (three-way ANOVA; Tukey's HSD post hoc at α = 0.05; VTA TH: F (11,75) = 1.92, p = 0.05; VTA NeuN: not significant, p = 0.16). Together, these data suggest that Parkin deficiency selectively increased the vulnerability of nigral DA neurons to the degenerating effects of neuroinflammation triggered by repeated low-dose intraperitoneal LPS injections. Parkin−/− mice display increased vulnerability to nigral DA neuron loss induced by repeated low-dose systemic LPS. A , Unbiased stereological analysis indicates that parkin−/− mice exposed to 3 months of low-dose systemic LPS followed by a 3 month wait and mice exposed to 6 months of low-dose systemic LPS display a significant reduction of TH-immunopositive neurons in the SNpc. The loss of TH-positive neurons in parkin−/− mice is reflected in the loss of NeuN-immunopositive neurons, confirming true neuronal loss. B , Unbiased stereological analysis indicates no loss of TH-positive or NeuN-positive neurons in the VTA in any of the groups. In A and B , error bars represent SEM, and the number of mice in each group is denoted in parentheses (n). Asterisks indicate significant differences compared with wild-type, saline-treated animals by three-way ANOVA followed by Tukey's HSD post hoc test at α = 0.05. C , Images of TH (purple) and NeuN (brown) immunohistochemistry from single coronal sections of wild-type mice in the 6 month treatment group compared with the parkin−/− mice in each of the exposure groups. The black arrowhead in high-magnification inset indicates a double-labeled TH/NeuN-immunopositive neuron, and the white arrowhead indicates a NeuN-only (nondopaminergic) neuron. Scale bars: low-magnification panels, 400 μm; high-magnification inset, 10 μm. To investigate whether the loss of nigral DA neurons was accompanied by loss of dopaminergic terminals at the striatum, we stained striatal sections for TH. Although slight decreases in striatal TH fiber immunoreactivity was detectable in brain sections from parkin−/− mice treated with low-dose systemic LPS for 6 months (Fig. 4 B), densitometric analysis of multiple sections indicated the decrease did not reach significance (Fig. 4 A). To extend and confirm these findings, we measured the tissue levels of DA and its metabolites in microdissected striatum by HPLC and electrochemical detection. In agreement with the immunohistological results, repeated low-dose intraperitoneal LPS injections did not cause striatal DA depletion or changes in DA turnover in either genotype (Fig. 4 C). 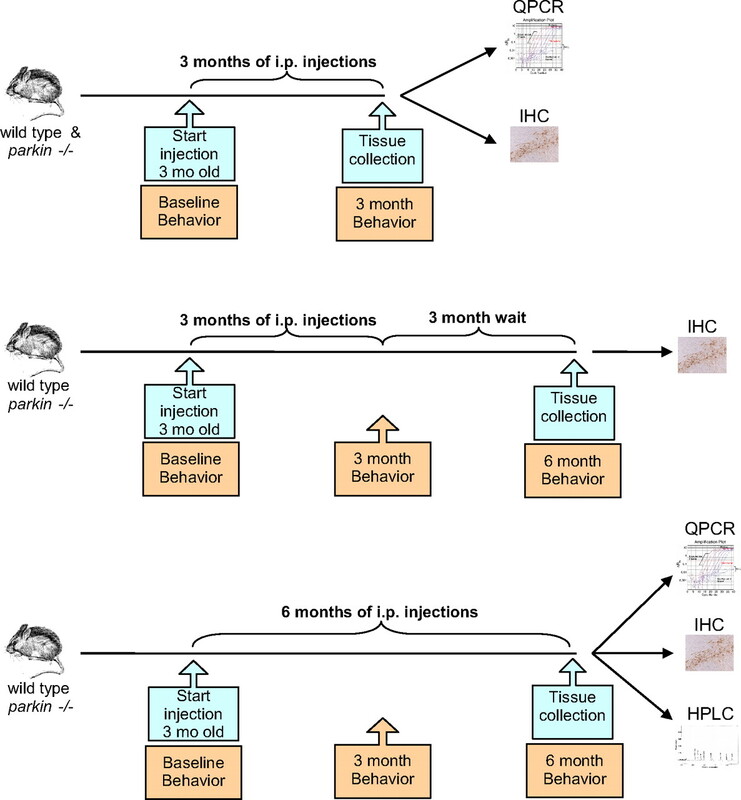 Repeated low-dose intraperitoneal LPS injections does not cause loss of striatal TH-immunopositive terminals or DA depletion in parkin−/− or wild-type mice. A , Densitometric analysis of striatal TH fiber density (see Materials and Methods) indicates no significant differences between genotypes or treatment groups. Bars represent mean ± SEM; n = 4 animals per group. Kruskal–Wallis analysis was performed to assess equality of means; genotype, p = 0.89; treatment, p = 0.60. B , Representative striatal sections stained for TH from mice in the 6 month treatment groups. C , No significant differences were found by two-way ANOVA between genotypes or treatment in the 6 month groups in the levels of DA and its metabolites in the striatum as measured by HPLC and electrochemical detection (dopamine, p = 0.50; DOPAC, p = 0.31; HVA, p = 0.19; 3-MT, p = 0.47; DA turnover, p = 0.14; n = 7–8 animals per group). To investigate the possibility that the LPS-induced nigral DA neuron loss in parkin−/− mice may have resulted from an enhanced neuroinflammatory response, we labeled midbrain sections from mice in the 3 month treatment groups with antibodies against TH and the pan-microglial marker CD68. Our analysis revealed comparable microgliosis between LPS-injected mice of both genotypes (Fig. 5 A); similar results were obtained with an antibody against the activation marker CD45 (data not shown). To extend these observations and quantitatively assess markers of neuroinflammation at the point at which nigral cell loss was evident, we used QPCR to measure the relative mRNA expression of Cox-1, TNF, CD45, and CD68 in midbrain and cortex in the mice from the 6 month treatment groups. We found that both parkin−/− and wild-type mice displayed comparable increases in midbrain CD45 and TNF mRNA in response to prolonged, serial low-dose intraperitoneal LPS (Fig. 5 B) (three-way ANOVA, Tukey's HSD post hoc at α = 0.05; TNF: F (7,31) = 3.93, p = 0.007; CD45: F (7,31) = 5.1, p = 0.001; CD68: not significant, p = 0.17; Cox-1: not significant, p = 0.19). To quantify the extent of astrocytosis, we measured mRNA levels of the pan-astrocyte marker connexin-43 by QPCR and found no difference between treatment groups or genotypes (data not shown). Additionally, we stained brain sections from mice in the 6 month treatment groups with hematoxylin–eosin and found no evidence of lymphocyte and/or neutrophil infiltration into the SNpc (data not shown). Together with results obtained after a 2 month systemic LPS exposure (supplemental Fig. 1B, available at www.jneurosci.org as supplemental material), these data suggest that even the longest systemic low-dose LPS regimen examined did not trigger exaggerated midbrain neuroinflammatory responses in parkin−/− mice relative to that displayed by wild-type mice. Neuroinflammation induced by repeated low-dose systemic LPS administration persists throughout treatment regimen in wild-type and Parkin−/− mice. A , After administration of intraperitoneal LPS for 3 months, increased immunoreactivity for the pan-microglial marker CD68 (red) is detectable in the ventral midbrain region (delineated by the presence of TH-positive DA neurons; green) compared with saline-treated animals. Scale bar, 400 μm. B , Quantification of neuroinflammation markers COX-1, TNF, CD45, and CD68 by QPCR in the ventral midbrain of mice treated with low-dose systemic LPS for 6 months. Brain regions are MB and CX. Asterisks indicate significant difference relative to wild-type saline-treated animals. Bars represent mean ± SEM; n = 3–4 per group. Three-way ANOVA was performed with Tukey's HSD post hoc at α = 0.05 (TNF: F (7,31) = 3.93, p = 0.007; CD45: F (7,31) = 5.1, p = 0.001; CD68: not significant, p = 0.17; Cox-1: not significant, p = 0.19). Detailed pairwise comparisons revealed the following significant differences: CD45-MB wild-type saline and Parkin−/− saline are different from wild-type LPS and Parkin−/− LPS. CD45-CX Parkin−/− saline is different from Parkin−/− LPS. TNF-MB wild-type saline is different from Parkin−/− LPS and wild-type LPS. TNF-CX Parkin−/− LPS is different from wild-type saline and wild-type LPS. We next hypothesized that the nigral cell loss in parkin−/− mice after prolonged, serial systemic LPS administration might have resulted from an inability to respond normally to neuroinflammation-induced oxidative stress. To test this hypothesis, we used QPCR to measure the level of expression of key antioxidant genes implicated in protection of DA neurons in the midbrain of parkin−/− mice that received 3 or 6 month low-dose systemic LPS administration. Based on the current literature, we elected to analyze the transcription factor NF-E2-related factor (Nrf2), which binds to the ARE (antioxidant response element) to induce expression of antioxidant and phase 2 detoxification enzymes, NADPH:quinone oxidoreductase (NQO1), heme-oxygenase-1 (HO-1), inducible nitric oxide synthase (iNOS), superoxide dismutase-1(SOD1), and SOD2. In the 3 month exposure cohorts, we found no differences between genotypes or treatment groups. In the 6 month exposure cohorts, we detected slight but significant differences in baseline levels of iNOS mRNA expression between saline-injected wild-type and parkin−/− mice, suggesting an age-dependent increase in this marker of oxidative stress in parkin−/− mice. Whereas SOD2 mRNA was significantly increased in parkin−/− LPS compared with wild-type saline, the LPS-induced increases in iNOS, Nrf2, and HO-1 mRNA were similar for both genotypes. NQO1 and SOD1 mRNA did not differ between any of the groups (Fig. 6) (three-way ANOVA, Tukey's HSD post hoc at α = 0.05; Nrf2: F (7,31) = 4.9, p = 0.002; HO-1: F (7,30) = 2.94, p = 0.02; NQO1: not significant, p = 0.44; iNOS: F (7,30) = 5.26, p = 0.001; SOD1: not significant, p = 0.19; SOD2: F (7,31) = 3.0, p = 0.02). Thus, saline-treated parkin−/− midbrain displayed signs of increased oxidative stress relative to wild-type midbrain, but the midbrain antioxidant response of parkin−/− mice to repeated and prolonged systemic LPS administration was similar to that displayed by wild-type mice. Oxidative stress responses to prolonged, serial administration of low-dose systemic LPS are not exacerbated in parkin−/− mice. Real-time QPCR analyses of microdissected midbrain tissue measured expression levels of Nrf2, HO-1, NQO1, iNOS, SOD1, and SOD2. Significant differences between levels of iNOS mRNA expression in saline-injected wild-type and saline-injected parkin−/− mice were detected in the 6 month treatment groups. Whereas SOD2 mRNA was significantly increased in parkin−/− LPS compared with wild-type saline, the LPS-induced increases in iNOS, Nrf2, and HO-1 mRNA were similar for both genotypes. Differences in NQO1 and SOD1 mRNA did not reach significance. Bars represent mean ± SEM; n = 3–5 per group. Statistical significance (indicated by asterisks) was determined by three-way ANOVA with Tukey's HSD post hoc at α = 0.05 (Nrf2: F (7,31) = 4.9, p = 0.002; HO-1: F (7,30) = 2.94, p = 0.02; NQO1: not significant, p = 0.44; iNOS: F (7,30) = 5.26, p = 0.001; SOD1: not significant, p = 0.19; SOD2: F (7,31) = 3.0, p = 0.02). We report here the development of a mouse model of nigral DA neuron loss that supports the hypothesis that genetic susceptibility and environmental factors synergize to enhance the vulnerability of nigral DA neurons. Specifically, by varying the length of serial systemic low-dose LPS exposure, we uncovered an increased vulnerability of SNpc DA neurons in parkin−/− mice relative to wild-type mice, implicating a specific role for Parkin in neuroprotection against inflammation-related degeneration. We detected no loss of TH-positive or NeuN-positive SNpc neurons in mice of either genotype exposed to low-dose systemic LPS for 3 months alone. However, after an additional 3 month wait, only the parkin−/− mice displayed a reduction in TH-positive (26% loss) and NeuN-positive (31% loss) neuron number. Moreover, when the injections of low-dose systemic LPS were administered for 6 months, the parkin−/− mice displayed a larger reduction (44% loss) of SNpc TH-positive neurons and SNpc NeuN-positive neurons (43% loss). It should be noted that after 6 months of repeated low-dose intraperitoneal LPS injections, both wild-type and parkin−/− mice displayed significant reductions in TH-positive neuron number (27 and 44% loss, respectively) compared with saline administration, whereas significant NeuN-positive neuron loss was observed for LPS-treated parkin−/− mice (43% loss) but not for LPS-treated wild-type mice (14% loss). It is possible that the reduction in TH-positive neuron count in wild-type mice may reflect downregulation of TH expression (and not frank neuron loss) and/or that the NeuN-positive neuron count in the wild-type group might have progressed to a significant level given additional time. The decrease in NeuN-positive neurons for both genotypes exceeds the expected range given the observed losses in TH-positive cells, assuming that 50–80% of the NeuN-positive nigral cells are dopaminergic and TH positive (McCormack et al., 2006; Kramer et al., 2007). Thus, it is possible that our systemic LPS regimen may have also caused some loss of nondopaminergic nigral neurons in parkin−/− mice. With the exception of a slight but significant decrease in the TH-positive (but not NeuN-positive) counts in parkin−/− mice treated for 6 months, we found no significant reduction in the number of TH-positive or NeuN-positive neurons in VTA, indicating greater vulnerability of SNpc over VTA to repeated low-dose intraperitoneal injections of LPS. Together, these results suggest that Parkin deficiency heightens the sensitivity of DA neurons in SNpc to inflammatory stimuli. Although we observed deficits in beam walk performance in LPS-treated parkin−/− mice, these locomotor abnormalities did not correlate tightly with nigral DA neuron loss or striatal DA depletion. Specifically, parkin−/− mice in the 3 month low-dose systemic LPS treatment group displayed beam walk abnormalities, yet there was no statistically significant nigral DA neuron loss. Moreover, the parkin−/− mice that developed both beam walk deficits and significant nigral DA neuron loss did not display striatal TH terminal damage or DA depletion. Given these observations, we suspect that the locomotor abnormalities in parkin−/− mice are not the direct or sole result of dopaminergic system dysfunction, but may instead reflect inflammation-related dysfunction in other neuronal populations involved in regulation of motor behavior. A number of non-mutually exclusive possibilities may explain the observed loss of nigral DA neurons without a parallel decrease in striatal TH immunoreactivity or decreases in striatal DA levels. First, our data suggest that the loss of nigral DA neurons occurs over the course of several months, which would allow compensatory upregulation of TH within existing terminals and perhaps sprouting of additional terminals. Another more interesting possibility is that the lack of obvious striatal damage may reflect an intrinsic difference in the inflammatory response/arsenal between the two brain regions. In support of this idea, 1-methyl-4-phenyl-1,2,3,6-tetrahydropyridine (MPTP) intoxication has been reported to elicit induction of iNOS mRNA to a significantly greater extent in nigra than in striatum, and predictably, genetic ablation of iNOS resulted in substantial preservation of nigral DA neurons but did not attenuate striatal dopaminergic fiber damage, which may be mediated instead by neuronal nitric oxide synthase (Liberatore et al., 1999). Similarly, orally administered PPARγ (peroxisome proliferator-activated receptor-γ) agonist pioglitazone attenuated the MPTP-induced glial activation and loss of DA neurons in SNpc but not the striatal glial response or loss of striatal DA and dopaminergic terminals (Breidert et al., 2002). Last, our previous studies in which intranigral, but not intrastriatal, infusion of dominant-negative TNF inhibitor significantly attenuated nigral DA neuron loss induced by a striatal 6-hydroxydopamine (6-OHDA) lesion (McCoy et al., 2006) suggested that marked differences in regulation of TNF-dependent inflammatory responses may exist between SNpc and striatum. A systematic investigation of these potential differences is needed to further establish their significance. Although our studies are the first to combine prolonged, serial systemic low-dose LPS injections with a genetic mouse model that displays dopaminergic dysfunction, the vulnerability of nigral DA neurons to LPS-induced degeneration is supported by multiple studies. Chronic low-dose LPS delivered intranigrally caused selective, delayed, and progressive degeneration of nigral DA neurons (Gao et al., 2002). Ventral mesencephalon cultures display increased sensitivity to both MPTP and rotenone when the exposure is combined with LPS (Gao et al., 2003a,b). Prenatal exposure to LPS predisposes nigral DA neurons to 6-OHDA or rotenone-induced degeneration in adulthood (Ling et al., 2004a,b). Preexposure to low-dose systemic LPS increases susceptibility to intrastriatal 6-OHDA-induced nigral DA neuron loss through a mechanism that is likely to involve proinflammatory signaling by IL-1β (interleukin-1β) and TNF (Koprich et al., 2008). Together, these studies suggest that neuroinflammation could act in concert with genetic susceptibility loci and/or other environmental factors to accelerate nigral DA neuron loss. In support of this idea, a recent report by Gao et al. (2008) demonstrated that overexpression of wild-type and pathologic forms of human α-synuclein interact with neuroinflammation (intranigral LPS injection) and synergistically contribute to dopaminergic neurodegeneration. The exact molecular mechanism by which loss of Parkin increases susceptibility to systemic inflammation-related nigral degeneration is unclear and will require further investigation. Our findings indicate that repeated low-dose LPS triggered a neuroinflammatory response in midbrain that preceded nigral DA neuron loss. Ventral midbrain DA neurons are extremely sensitive to the neurotoxic effects of TNF (McGuire et al., 2001), and the extended systemic LPS regimens used in our study that induced nigral cell loss also increased TNF expression in the midbrain. Our previous work demonstrated that blocking soluble TNF signaling in SNpc rescues ∼50% of nigral DA neurons from 6-OHDA- or low-dose intranigral LPS-induced degeneration (McCoy et al., 2006), further implicating TNF as a critical mediator of nigral DA neuron death. To date, specific TNF-dependent signaling pathways required to exert neurotoxic effects on DA neurons have not been identified. However, it has been firmly established that activation of TNFR1 elicits two opposing signaling cascades: a proapoptotic signaling cascade involving MAPK and executioner caspase activation, and an anti-apoptotic signaling cascade involving activation of the NFκB pathway; whether a cell lives or dies is determined by the relative strength and duration of these signaling cascades (Aggarwal et al., 2000; Chen and Goeddel, 2002). Given that Parkin has been reported to activate the NFκB pathway by enhancing proteasomal degradation of the IKK (IκB kinase) complex (Henn et al., 2007), it is possible that loss of Parkin function in DA neurons results in attenuated activation of the NFκB pathway in response to a TNF stimulus, thus biasing the functional outcome of a TNF stimulus in favor of the apoptotic cascade and hastening the death of nigral DA neurons. Future studies will be aimed at investigating this and other mechanisms. Our analyses of oxidative stress markers in the midbrain of parkin−/− mice did not indicate exaggerated responses to prolonged, serial systemic LPS administration relative to that of wild-type mice, making it unlikely to constitute the basis for the increased nigral DA neuron loss in LPS-treated parkin−/− mice. Although this finding was somewhat unexpected, it is consistent with reports that Parkin deficiency does not increase susceptibility to oxidative neurotoxins such as MPTP, 6-OHDA, and methamphetamine (Perez et al., 2005; Thomas et al., 2007; Zhu et al., 2007). However, if robust increases in oxidative stress markers represent an attempt to restore redox homeostasis, we cannot rule out the possibility that the inability of parkin−/− mice to mount a more robust antioxidant response to prolonged, serial systemic LPS administration might have contributed to increased nigral DA neuron loss. In conclusion, we have developed an animal model of nigral DA neuron loss using prolonged, serial intraperitoneal LPS injections as the environmental trigger to elicit nigral degeneration in parkin−/− mice, suggesting a specific role for Parkin in neuroprotection against inflammation-induced degeneration. We believe the use of this model in preclinical neuroprotective trials may help identify compounds that can halt or delay the progressive degeneration of the nigrostriatal pathway. Revision received August 30, 2008. This work was supported by The Michael J. Fox Foundation for Parkinson's Research (M.G.T., M.S.G.) and the National Institutes of Health–National Institute of Neurological Disorders and Stroke Grant 1R01NS049433-02 (M.G.T.). We thank M. K. McCoy and F. E. McAlpine for assistance with behavior studies, S. Jiang for assistance with QPCR, K. Crouch for assistance with histology, G. Kramer for assistance with HPLC, and members of the Tansey and Goldberg labs for useful discussions. (1995) Development of calretinin-immunoreactive unipolar brush-like cells and an afferent pathway to the embryonic and early postnatal mouse cerebellum. Anat Embryol (Berl) 191:541–559. (2000) in Cytokine reference, TNF receptors, eds Oppenheim JJ, Feldmann M(Academic, London), pp 1620–1632. (1998) Glial pathology but absence of apoptotic nigral neurons in long-standing Parkinson's disease. Mov Disord 13:221–227. (2002) Protective action of the peroxisome proliferator-activated receptor-gamma agonist pioglitazone in a mouse model of Parkinson's disease. J Neurochem 82:615–624. (2000) Interaction among mitochondria, mitogen-activated protein kinases, and nuclear factor-kappaB in cellular models of Parkinson's disease. J Neurochem 74:1384–1392. (2005) Nonsteroidal antiinflammatory drug use and the risk of Parkinson's disease. Ann Neurol 58:963–967. (2008) Peripheral inflammatory biomarkers and risk of Parkinson's disease. Am J Epidemiol 167:90–95. (2006) Genetics of Parkinson disease: paradigm shifts and future prospects. Nat Rev Genet 7:306–318. (2003) Fluoro-jade identification of cerebellar granule cell and Purkinje cell death in the alpha1A calcium ion channel mutant mouse, leaner. Neuroscience 118:667–680. (2002) Microglial activation-mediated delayed and progressive degeneration of rat nigral dopaminergic neurons: relevance to Parkinson's disease. J Neurochem 81:1285–1297. (2003a) Synergistic dopaminergic neurotoxicity of the pesticide rotenone and inflammogen lipopolysaccharide: relevance to the etiology of Parkinson's disease. J Neurosci 23:1228–1236. (2003b) Synergistic dopaminergic neurotoxicity of MPTP and inflammogen lipopolysaccharide: relevance to the etiology of Parkinson's disease. FASEB J 17:1957–1959. (2008) Neuroinflammation and oxidation/nitration of α-synuclein linked to dopaminergic neurodegeneration. J Neurosci 28:7687–7698. (2006) In vivo imaging of microglial activation with [11C](R)-PK11195 PET in idiopathic Parkinson's disease. Neurobiol Dis 21:404–412. (2003) Parkin-/- mice exhibit nigrostriatal deficits but not loss of dopaminergic neurons. J Biol Chem 278:43628–43635. (1999) FcεRII/CD23 is expressed in Parkinson's disease and induces, in vitro, production of nitric oxide and tumor necrosis factor-α in glial cells. J Neurosci 19:3440–3447. (2008) Neuroinflammation mediated by IL-1 beta increases susceptibility of dopamine neurons to degeneration in an animal model of Parkinson's disease. J Neuroinflammation 5:8. (2007) Absence of Ret signaling in mice causes progressive and late degeneration of the nigrostriatal system. PLoS Biol 5, e39. (2004) Quantitative real-time PCR measurement of regulators of G-protein signaling (RGS) mRNA levels in mouse tissues. Methods Enzymol 389:3–15. (2004a) Combined toxicity of prenatal bacterial endotoxin exposure and postnatal 6-hydroxydopamine in the adult rat midbrain. Neuroscience 124:619–628. (2004b) Rotenone potentiates dopamine neuron loss in animals exposed to lipopolysaccharide prenatally. Exp Neurol 190:373–383. (2000) Association between early-onset Parkinson's disease and mutations in the parkin gene. French Parkinson's Disease Genetics Study Group. N Engl J Med 342:1560–1567. (2006) Decreased susceptibility to oxidative stress underlies the resistance of specific dopaminergic cell populations to paraquat-induced degeneration. Neuroscience 141:929–937. (2006) Blocking soluble tumor necrosis factor signaling with dominant-negative tumor necrosis factor inhibitor attenuates loss of dopaminergic neurons in models of Parkinson's disease. J Neurosci 26:9365–9375. (2003) Presence of reactive microglia in monkey substantia nigra years after 1-methyl-4-phenyl-1,2,3,6-tetrahydropyridine administration. Ann Neurol 54:599–604. (2005) Glia and their cytokines in progression of neurodegeneration. Neurobiol Aging 26:349–354. (2006) Microglial activation correlates with severity in Huntington disease: a clinical and PET study. Neurology 66:1638–1643. (2005) Parkin-/- mice are not more sensitive to 6-hydroxydopamine or methamphetamine neurotoxicity. BMC Neurosci 6:71. (2007) Neuroinflammatory mechanisms in Parkinson's disease: potential environmental triggers, pathways, and targets for early therapeutic intervention. Exp Neurol 208:1–25. (2007) MPTP and DSP-4 susceptibility of substantia nigra and locus coeruleus catecholaminergic neurons in mice is independent of parkin activity. Neurobiol Dis 26:312–322. (2006) Nonsteroidal anti-inflammatory drugs and risk of Parkinson's disease. Mov Disord 21:964–969. (2004) Loss of locus coeruleus neurons and reduced startle in parkin null mice. Proc Natl Acad Sci U S A 101:10744–10749. (2002) Inflammation and Parkinson's disease. Curr Drug Targets Inflamm Allergy 1:221–242. (2007) Inflammation as a causative factor in the aetiology of Parkinson's disease. Br J Pharmacol 150:963–976. (2006) Role of nitric oxide in Parkinson's disease. Pharmacol Ther 109:33–41. (2007) Non-motor behavioural impairments in parkin-/- mice. Eur J Neurosci 26:1902–1911.